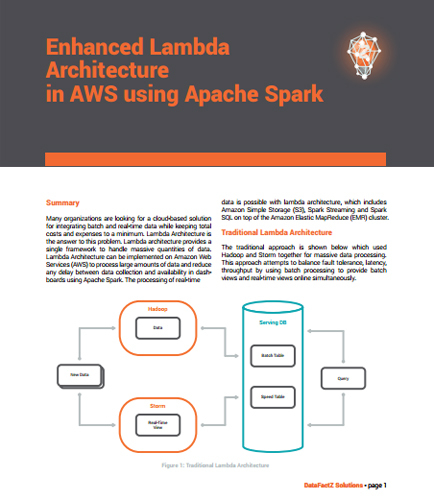 "Benefits of enhanced Lambda Architecture in AWS using Apache Spark"
Lambda architecture can handle massive quantities of data by providing a single framework. Through Amazon Web Services, we can quickly implement the Lambda Architecture, reduce maintenance overhead and reduce costs. Lambda Architecture also helps in reducing any delay between data collection and availability in dashboards using Apache Spark. The technological platforms such as cloud, big data, telecom industry, and social media are engaging towards better customer service, workforce collaboration, and cost efficient means. It is essential to address the maximizing of IT infrastructure and the efficiency of physical data centre in order to intelligently monitor the availability of resources. The Data Center Infrastructure Management (DCIM) system allows for an intelligent edge that can spell the difference between success and failure to an organization. Organization that spends efficiently on its resources always gains a competitive edge to its competitors. Find out more about the DCIM systems and enhance your business productivity through the White paper below to address your concerns: Does my data center perform to the optimum levels of efficiency? How will DCIM systems bring innovation and competitive edge to my organization? Is the space utilization and connectivity tracking of the data center equipment getting hampered? Big data is the act of collecting huge amount of enterprise data that can be used for future analysis. Big data helps all kind of industry data to grow securely that includes government, banking, retail, education and healthcare. Big data stores all kind of data including structured, unstructured and semi structured data, which contains valuable information about core functions of an enterprise such as finance, marketing, procurement.